Home › Research › Result of the Month › Communication System Receiver Filter: Searching is better than designing! Communication System Receiver Filter: Searching is better than designing! Digital IIR filter implementations are important building blocks of most communication systems. Conventionally, the filters are specified via amplitude and phase in the frequency domain as given by the matched filter theory. Digital filter implementations, nonlinear analog components and channel characteristics introduce a multitude of additional effects, though. These are not taken into account by the matched filter theory. Which, in turn, leads to results providing a rough estimate, at best. Our work reforms the design process, defines the system's bit error rate as the main objective and searches the huge -- yet finite -- filter design space for suitable coefficients. 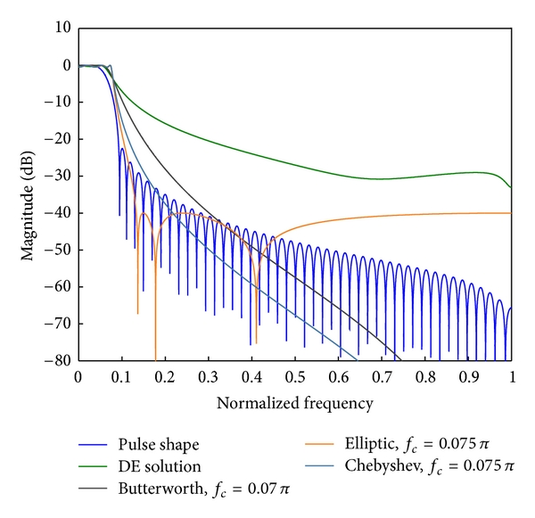 The figure shows the magnitude responses of conventional filter designs (Butterworth, elliptic, and Chebyshev) and contrasts it with the magnitude response of the solution identified by differential evolution (in green). Observe that the optimal solution’s gain is significantly higher than the filter specification derived from the matched filter assumption (in blue). The green filter characteristic results in a BER better than any other filter design shown (see Figure 9 in the paper). For more information please refer to our paper "Holistic Biquadratic IIR Filter Design for Communication Systems Using Differential Evolution" by Alexander Melzer, Andreas Pedroß and Manfred Mücke (OPEN ACCESS! ).